The joy a bouncy castle brings when you take your kids to a fete or a birthday party is palpable, but why wait until then? With the Chad Valley 6ft Bouncy Castle that delight can be had every day as soon as little ones step outside to play in the garden. A fantastic way to get your most cherished fit and active, watch on as they leap and jump about with joy. For more fun they can invite friends over to play too! 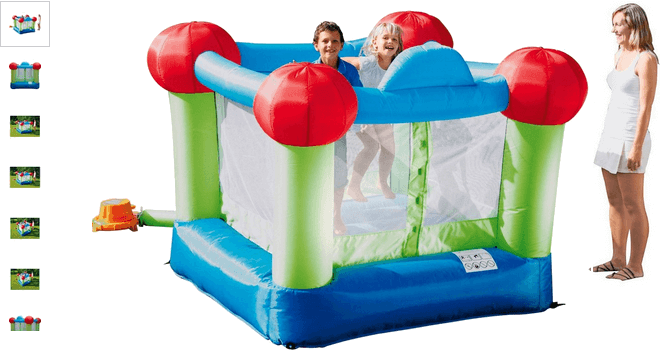 With a constant air flow system and a sturdy electric fan complete, the robustly designed Chad Valley 6ft Bouncy Castle is sure to be a hit. Get money off with April 2019 free Argos voucher codes, see if there's a discount code for the Chad Valley 6ft Bouncy Castle product.